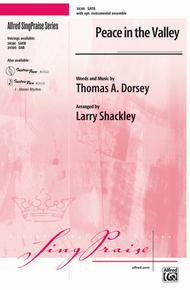 Peace in the Valley composed by Thomas A. Dorsey (1899-1993). Arranged by Larry Shackley. Choir Sacred. SATB choir. Choral (Sacred); Choral Octavo; Worship Resources. Sing Praise. Sacred. Choral Octavo. 12 pages. Published by Alfred Music (AP.29281).Soulful gospel! Originally written by Thomas A. Dorsey in 1939 for his friend, the incomparable Mahalia Jackson and here arranged by Larry Shackley, the true healing gospel spirit shines through. Multiple voicings, instrumental parts and an accompaniment track are available.Inst. Parts Available (choral); Recorded Acc. Available.About Sing PraiseIncludes choral works with optional orchestration perfect for praise bands, chamber ensembles, and orchestra. Featuring music for contemporary and "traditional blended" worship, each octavo includes relevant scripture references.